Recently the National Oceanic and Atmospheric Administration (NOAA) announced a groundbreaking public private partnership between Microsoft co-founder Paul G. Allen and NOAA’s Pacific Marine environmental Laboratory. 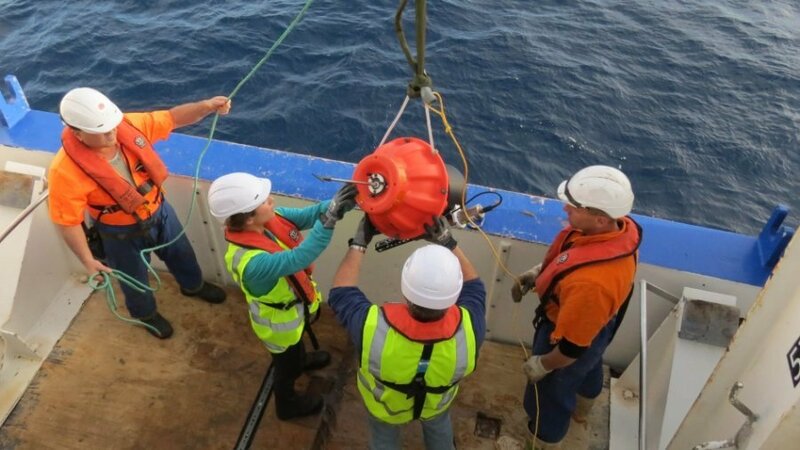 They are working together to deploy a large array of new deep ocean floats to expand ocean observations in a key area of the western South Atlantic Ocean. The $4 million grant is in support of an initiative to expand our understanding of deep ocean currents and their impact on climate. The instruments, called Deep Argo floats, can collect data down to nearly four miles deep, and hold the promise of better understanding how the bottom half of the ocean may influence long term weather, climate, and sea level rise. The western South Atlantic was chosen by NOAA for the array because it provides a window into the global thermohaline circulation, called the great ocean conveyor belt, which is linked to global climate variations. At the bottom of the basin, very cold, dense Antarctic water flows northward while just above, slightly warmer, lighter North Atlantic deep water flows southward. Limited dataoffsite link have shown that the Antarctic water has been warming over the last three decades. The Deep Argo floats are the shape and size of an exercise ball, with a pressure-resistant glass sphere at their core. The floats change their buoyancy by pumping oil into or out of an attached bladder. In order to measure temperature, salinity and depth, they will carry sensors. They will descend almost to the sea floor and drift. They will rise to the surface every 15 days to transmit data via satellite before diving again, says Gregory Johnson, an oceanographer at NOAA’s Pacific Marine Environmental Laboratory in Seattle, Washington, who will lead the project. Johnson further explained that understanding ocean temperatures is vital to understanding climate-and climate change. Since 1970, the oceans have absorbed more than 90 percent of the excess heat from greenhouse warming. That heat can cause changes in ocean circulation, which impacts temperatures and rainfall around the globe. This undertaking builds upon the success of the Argooffsite link, an international array of almost 4,000 freely drifting floats that measure temperature and salinity in the upper 2,000 meters of the global ocean. For almost seventeen years Argo has revolutionized oceanography, providing data publicly in near real-time that are vital for understanding the roles of ocean temperature, salinity, and current variations on weather, climate and ecosystems. This new project will be the first comprehensive sampling of an entire deep ocean basin by this technology, which has been previously tested only in small pilot deployments. Once the data are collected and verified as valid, the information will be released online for anyone to analyze.